Milos is another, beautiful undiscovered Cycladic island, with maybe the most interesting coast of any other island this size in the whole world. A volcanic island, Milos is known as the island of many colors, mainly because of its beautiful, colorful rock formations. Milos is the most south west island and 5th largest island of the Cyclades archipelago, only 3-5 hours from Athens by ferry, or 30 minutes by aircraft. It is located west of Santorini, right between Heraklio, in Crete and the mainland of Greece. It has 5,000 inhabitants that earn their living primarily through tourism and mining, and some through fishing, farming and agriculture. Milos is another island in Greece, with a unique horse shoe-shape, set in the blue waters of the Aegean, Milos, steals the hearts of all its visitors…and now will steal yours! There are many beautiful beaches on Milos, archaeological sites and interesting things that you should not miss while on holidays on Milos. Information that might be necessary for you to discover Milos is right here! If you would like to visit the beautiful island of Milos, you may book your accommodation through our site as well as read all kinds of information about Milos and its neighboring islands. 31 August of the Almighty, in Mytaka and Fires of Kyriafgoustou Square Tripiti with great celebration. 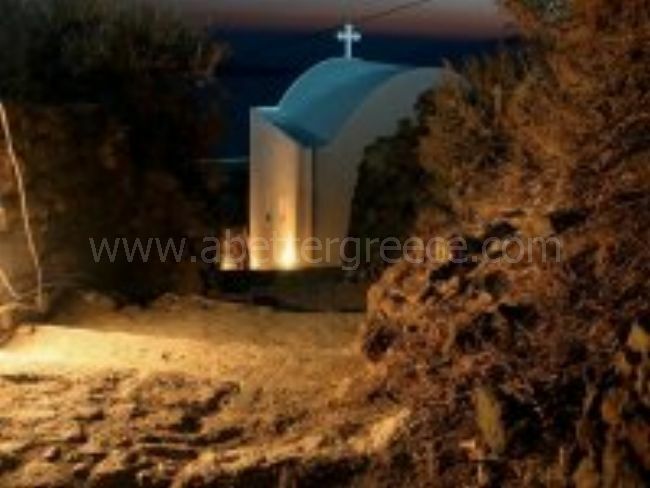 Night life on Milos: Milos is an island of serenity and relaxation. 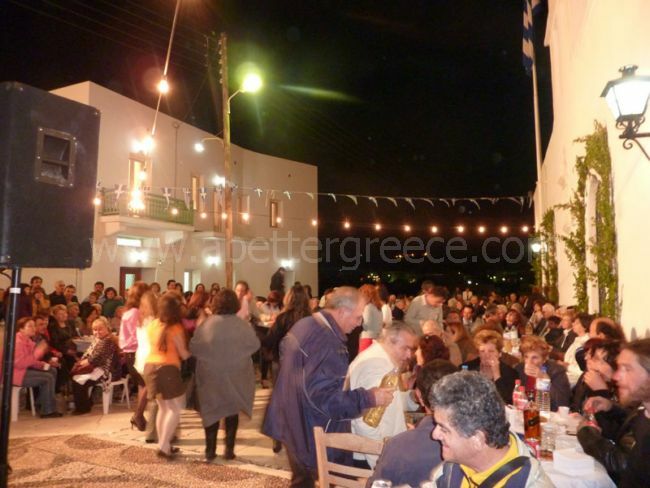 However, for those seeking a lively night moments, Milos offers them as well. Bars and nightclubs, mainly concentrated in the port, waiting to be entertained until the early hours with Greek and foreign music, having mostly a stunning harbor and the sea. Water sports on Milos: The more than 75 beaches and the natural and secure the bay, ideal for browsing and for various water activities. Milos offers a variety of activities for all tastes, while revealing a depth of greatness. Visiting the island, you can admire the amazing depths of diving, wander into the sea, the volcanic islands and traditional villages by canoe-kayak, navigate to the beaches and natural beauties of Milos participating in a marine excursion to upload Your adrenaline windsurfing and kite-surfing, relax and be familiar with marine life while fishing, and enjoy the clean sea, sun and beautiful sailing bays maleate. Fishing on Milos island: Milos because of volcanic geology, is a very rich “fishing place”. The reefs, caves and rocky coast are natural habitats for a wide variety of fish. Both fishing from boat or from shore, and the snorkeling in the waters of Milos will definitely be an enjoyable and unique experience. The island, like any Cycladic island, ideal for fishing. This can be done by snorkeling or under water but with nets, lines, bolts, vertical or reeds psaremato. The fish vary depending on season and region, while the rest of marine fauna of Apple extremely rich and includes many species of fish (mullet, bream, sea bass, breams, saddled, beetles, amberjack) and even octopuses, squid, cuttlefish, lobsters) . Wind surfing and kite surfing on Milos: The ideal weather in Milos and unique waters, making it a perfect destination for amateur and masters of windsurfing and kite surfing. The natural bay of the island provides maximum security. We recommend the beaches and the Achivadolimni Papikinos to enjoy the freedom of the surf board or fly over the turquoise waters. Sailing on Milos: The sailing is offered to discover the hidden beauties of Milos, since it can lead to hidden coves and beautiful beaches, enjoy your holiday in freedom and autonomy. Still, because of the proximity of the apple from the other Cycladic islands, you can combine your holidays in Milos acquaintance of the other nearby islands. At the port of Adamas has created a modern pier that allows you to provide water and fuel, free internet, opportunity for shopping, drinks, ice, etc., restaurants, cafes, bus or taxi tours on land and access to health services (clinic). 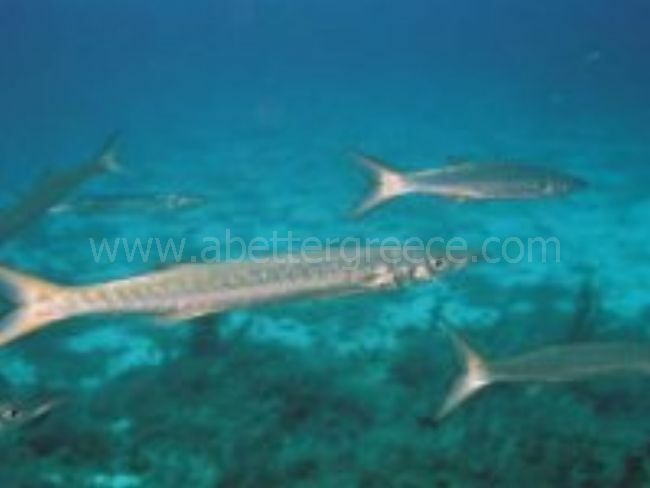 In the bay of Ayios Dimitrios, south of Milo, and offers a good protection from the wind. Pollonia, located on the south side of the Strait Milos-Kimolos just beneath the cape Pelekouda. (Beware of shoals that extend north and south of the entrance). Voudia bay, which lies approximately 1 mile southeast of Pollonia. You can anchor at a depth of 5-8 meters in the northern corner of the bay or in the southwest Psilonisi for protection from the wind. Provatas, a large, two-headed bay on the south side of Milos and Achivadolimni, ideally only in good weather. In Rivari, a secluded bay on the southwest side of the bay of Milos. The depth to moor reaches 3-4 meters. and suggest a retreat from the southern winds. In the northwest corner of the Bay of Trade, a large bay to the west of the bay of Milos, open from the east – northeast. Canoe and Kayak on Milos: Due to the volcanic formation on Milos has spectacular coastline, sea caves and tunnels, ideal for exploring. Simultaneously provides clean water, awesome beaches and nearby uninhabited islands suitable for walks. 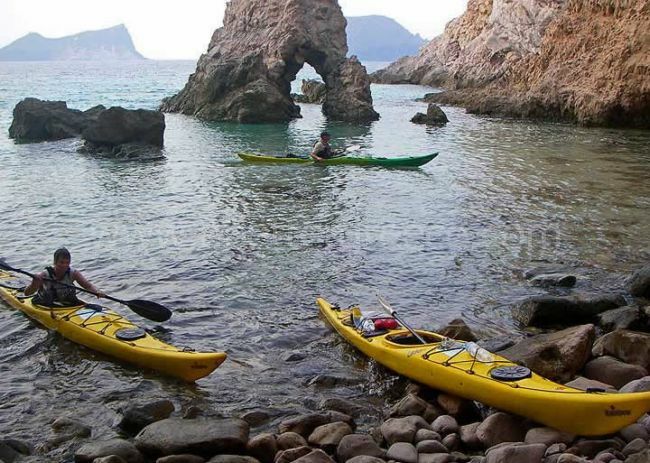 With sea-kayak you can relax on the beaches of Milos, wander around the nearby islands and have fun doing paddle. From April to October offer guided day trips canoe-kayak, and multi-day visits to nearby islands along with camping, for lovers of adventure. Sea excursions on Milos: The circumnavigation of the island by boat or yacht is a unique experience that you should live by visiting Apple. With excursions have the opportunity to visit the beaches are not accessible by land (the famous seafood Meteora or thieves, emerald cave Sykia Glaronisia and others), swim in crystal clear waters and inaccessible beaches and enchanting to admire the mineral wealth of the island, explore caves or esoteric and visit neighboring islands. Several vessels, fishing boats and sailboats offered for excursions and have the option of choice, depending on your needs and your mood. Most boats leave daily from the pier at the port of Adamas. Some of them do the whole tour and visit the island and neighboring island of Kimolos, and most sailboats go for less beaches, but leave more free time for swimming and shooting, and usually offer food. Still, apart from Adamas, pulling boats from the beach of the Garden to Kleftiko and from Pollonia to Kimolos, cave Papafragas and Glaronissia. 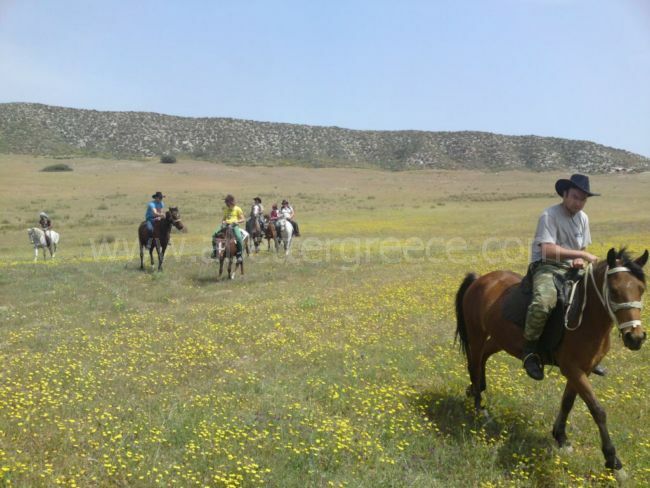 Horse riding on Milos: Milos is offered for free horse riding. You can ride to the beach or the mountains or even horse riding lessons. Walks with the horses do not require previous experience and are always accompanied by experienced guides. You can choose the location you want to browse or follow one of the suggested routes. Rock climbing on Milos: For adventure lovers there are two climbing areas to Apple in Tourla of Bani and Glaronissia. Pollonia, it is also possible to climb the “Glaronissia.” Glaronisia is one of the best climbing areas in Greece are the only islands of basalt shaped six-sided rods. The hot springs on Milos: Milos is due to volcanic activities and thanks to post-volcanic hydrothermal activity has many hot springs, known since antiquity for their healing properties. Typically, Hippocrates mentions the ‘E’s book “On epidemics” treat an illustrious Athenian suffering from skin disease at the Baths of Pit in Milos. Also, refer to the spas of the island is by a French professor of botany Pitton de Tournefort in “seeing” texts in 1771. The island has many hot springs with different temperature and composition of water. Walking around Milos: Milos has the largest network of dirt roads in the Cyclades, which is accessible by walkers. The paths are not signposted and organized, but depending on the route you choose, you have the opportunity to go through volcanic formations, archaeological sites, picturesque churches, old mines, beautiful beaches and generally get to know through his routes are the natural wealth and long cultural traditions. Below you can find some suggested routes. Number of trips and related activities organized by the Group of Friends of Mountain and Sea (Phone: +30 6978585478 – George Mallis). – Tripiti-Catacombs-Theater-Prophet Elias-baptistery-Black Wall-Venus de Milo. Arriving at the village of Tripiti optional climb the hill to see the windmills and the spectacular sea views. Then go down to the catacombs, where if you have transportation to park there. After you see the catacombs, climbing the stairs to return, you will see a path on the left. Follow it and that leads you to the Ancient-Roman Theatre. From there follow the path right after you leave the theater over the alley turn left. Hurry to get in position three churches where there is the Baptistery, and follow the road to the church of Prophet Elias, distinguished on a small hill in front of you. Will necessarily pass through a field and move up the approximately 50 landings that will lead you to the church from where the views will amaze you. Returning by the same road and go straight from the baptistery until you see the sign that tells where it was discovered the Venus de Milo. Alternative: Tripiti-Catacombs, Ancient theater-Klima: Follow the above route to the ancient theater. Then get off the skalopatakia located on the opposite side of the theater and gives Klima. In staging the Vine to the Tripiti, you can follow the paved road or alternatively go up the stairs to go uphill to your left and go through the church of Agia Paraskevi to return to the catacombs. – Plaka – Panayia Thalassitra – Castle. Above Pplaka, the slope of the hill stands the church of Panayia Thalassitra with the coat of arms of the Crispi lintel. Climbing the stairs at the top of the castle where you can enjoy magnificent views and spectacular sunsets. – Pollonia – Phylakopi. Near Pollonia Phylakopi is one of the greatest cities of the prehistoric Aegean, where ruins of the magnificent cyclopean wall and populous town. – Katsogria – St. George – Agia Marina – Rivari – Empourio. Trail in west Milos – area of outstanding natural interest included in the network Natura 2000. The route passes through the lagoon Rivari and ends at the small port of Empouriou. – Zefiria – Ayia Kyriaki Beach (Trail about 5 km Duration: 2 hours). The route starts from Zefiria and heads to the airport and the greenhouses. It then passes through the area fleets and between two hills, parts of the volcano. Soon he meets a quirky landscape that resembles a meadow and a little searching here are the fumaroles. Very near here is the beach of Ayia Kyriaki. – Phylakopi – Papafragas – Pachena – Agios Konstantinos – Mytakas-Sarakiniko – Mandrakia (Trail 9 km Duration: 3 hours). On this excursion you have the opportunity to see the famous Sarakiniko and Papafranga, the archaeological site of Phylakopi from where it started, and pretty village in Mandrakia where you will end. – Cape Vani (old mines) – Agia Marina (Trail 12 km) Duration: 5 hours.The route starts from the old mines ferromanganese Cape Vani. You will walk the dirt road Xerokambos to Ampourdektaki (located near the bay of Agios Dimitrios) and continue on the path of hunters that will lead you to Empourio. From there (from the main dirt road) to reach the lagoon Rivari, the Fatourena and finally ascend to St. Marina. Achivadolimni: The largest beach with white sand and deep blue shallow waters. There is no organized camping and the beach is accessible by bus. It took its name from the pond located opposite and is full of clams. The Achivadolimni or Chivadolimni divided into two beaches, the first is more quiet and secluded, while the second is busy, organized and has a beach bar and restaurants. The beach is ideal for lovers of surf and kite-surf. Lagkada: The closest beach to the port of Adamas with clear water and many trees for shade. It has a large sandy beach with sand and chrysolefki is organized. Papikinou: This large-scale beach is 1 km east of Adamas and the blue flag of the European Union since 1993. It has many trees, umbrellas and sunbeds, restaurant and volleyball. It is ideal for children, as the water deepens very slowly, while the beaches are among the most gentle waves on the island. Empourio: Passing by the beach and Fatourenas Rivari will find a picturesque harbor, old commercial harbor beach, a few rooms and traditional taverns. Sarakiniko: The most famous beach, thanks to the unique lunar landscape. White volcanic rock formations with brilliant deep blue waters. There is a small natural harbor, enclosed between the rocks, sand and green-blue waters. The scenery is stunning, with constant changes of volcanic materials and abundant fossils. The name is because pirates used it as shelter. (Also surviving are carved in rock cleats ships.) The white rocks and the lack of vegetation creates a sense of unique, hard to forget. Papafragas: Beside the ruins of the ancient city of Phylakopi, are the three caves Papafranga. The cave Papafranga is a deep sea cave, where you can swim in turquoise waters among grayish rocks leading to the open sea. The beach is small, surrounded by gigantic colored rocks, while to get there you need to get off a steep carving on the rock. In Byzantine times was used as the bases of the pirates and took its name from the last franc Papa who used the beach to guard the boat. Fyropotamos: Seaside village with a small, but organized beach suitable for swimming and fishing. It has many trees and creek surrounded by “wires”. The beach is sandy and has a beach bar. In the end, after the fishermen’s houses, you will see the derelict stairs loading and the church of St. Nicholas. Mandrakia: Traditional fishing village, surrounded by colorful wires. It offers rooms and restaurant, and quiet little beach about 150 meters, with fine dark gray pebbles and trees. Tourkothalassa: Sheltered beach sand, pebbles and crystal clear waters. Mytakas: Traditional village with azure waters and sandy beach. Ayios Konstantinos: Beautiful and quiet beach in the picturesque harbor surrounded by cliffs. Ayios Konstantinos, which takes its name from the chapel of Saint, is a beach with turquoise waters, closed as lake sand and several wires. It also has two small caves, always ready for exploration. Pachaina: Spacious beach overlooking Glaronisia, rich in sand and some trees, the Pachaina will inspire you through the blue waters and the rocks that emerge from them. Kleftiko: Kleftiko or “Sea Meteora” as many call it, is a set of greyish rocks with strange shapes and formations, with caves and hollows I created over the centuries by wind and sea. To enjoy the crystal blue waters and unique formations must come by boat or yacht. Kleftiko formerly used as a refuge and base for pirates and from there it took its name. Tsigrado: Beach surrounded by towering cliffs, with white sand and emerald waters. Access to the truly exotic beach is a relatively easy road. To enjoy its beauty, but you must get off the hill by a steep glide path which is covered with sand. The beach is not organized, but you can buy what is needed from the nearby beach Firiplaka. Gerontas: The farthest south beach, which is accessible by car. The access is difficult because of the dirt road and 10 minutes walking you have to do until taken to the beach, but it will definitely reward your trouble. Elder is a beautiful bay embraced by white cliffs and caves, dark sand and turquoise waters. You will be impressed by the rock-shaped bridge that unites sea and land, and the crystal clear waters. Firiplaka: Extensive beach with majestic towering volcanic cliffs, snow-gray fine sand and white pebbles. It has shallow turquoise waters, beach bar and sunbeds with umbrellas. The Firiplaka enables and those who want to avoid the crowds to enjoy the splendor and beauty of the two most secluded beaches (then the first is organized) enough to walk along the sea and the volcanic rocks. Ayia Kiriaki: Large and organized beach with sunbeds, umbrellas, beach bars and golf beach volley. The cool waters, colorful pebbles and extensive thick of sand will amaze you. Within walking distance of the beach are a few rooms and a restaurant. Provatas: An ideal beach for families because it has abundant reddish brown sands (thanks to iron oxides) and very shallow water, suitable for children to play. It is organized with sun beds and umbrellas, available hotel rooms and restaurants. Access is easy thanks to the asphalt road (7 km from Adamas and well marked), and there is frequent bus service. Paliochori: 8 km from Adamas, on the main paved road after Zefiria easy reach by car or bus in the village of Paleochora. The resort has rooms, beach bars and restaurants with Greek cuisine, fresh seafood and overlooking the deep blue sea. Ayios Sostis: Extension of Provatas Beach, has a restaurant and some rooms. It is a small beach and shallow beach, and owes its name to the chapel located just above the beach. Kipos: Apart from a sandy beach, Kipos beach has a port from from where boats begin to Kleftiko, a restaurant and a few rooms. Gerakas beach on Milos: Located in between Tsigrado and St. Sunday beach is Gerakas, which is accessible only to vessels operating touring trips. Theiorycheia: In the small bay Paliorema you can enjoy a swim at the beach with yellowish pebbles and crystal clear waters, while your mind travels through time, through the ruins of the old plant mines export sulfur in operation until 1956. The beach is one of the geological attractions of the island and you can notice the cars on the tracks, old rusted tools and unused parts in storage hardware, while enjoying a swim in clean water and wild mysterious landscape. Small beaches with crystal blue waters and beautiful colorful pebbles. All of them are worth a visit thanks to the particular nuances of the surrounding rocks and crystal clear waters. Ammoudaraki: Beautiful beach with rich golden sand next to the Triads. To get pass the Agia Marina, pass the monastery of St. John Siderianos and turn right, follow the dirt road. Ayios Ioannis: The beach got its name from the monastery of St. John Siderianos. To find this white gold sand which is divided into three parts connected together by paths, should cross the dirt road about 12 km. The first is accessible by vehicle, while the other two should be enough to walk off and rocks. Sikia: Cave of outstanding natural beauty, accessible only by sea. The Cave of the Fig Tree has no roof, so the rays of the sun to enter the cave, illuminating the turquoise waters and create a visual feast of color and sparkle. Triadas: Three secluded sandy beaches with crystal clear shallow waters, placed one after another. The bucolic landscape is a sandy blond closed between rocks. The journey is long, but the eerie beauty will compensate. Agkathia: Several inaccessible beach (because dirt will have to cross to get there), but will reward your trouble thanks to the shallow blue waters, its sheltered bay and wide sandy beach. To get there, you will pass the monastery of Agia Marina and turn right at the second intersection you come across. The castle on Milos: The Castle was built in the 13th century on the hill of Prophet Elias in the northwest of the island (current plate). Today it is inhabited, but it offers visitors a view of unparalleled beauty in the bay of the island and a magnificent sunset, which will reward the effort you can climb to the top. Also, going up to Castro will have the opportunity to see the church of Virgin Mary or Virgin Skiniotissa, and the church of Panagia Thalassitra. The Venetian Castle is not surrounded by walls, like most of the castles of the Cyclades, but protected by the same houses. Proceedings of the castle was used to protect locals from pirate attacks (a common phenomenon at the time), and to control the movement of ships in the gulf of Adamas. On top, the “Inside Castle”, was the Tower of Raj, called Palace and around the tower there were very few houses. The foundation became the first Duke of Naxos Marco Sanudo in Mesa Castro were mainly houses timariouchon topotiriton and the Duke, and other relatives and Franks. Thiorihia (Sulfur mines): On the east side of the island of Milos, lies Paliorema bay with clear waters and yellowish pebbles, colored by brimestone. There he worked in brimestone mine of Victor Mela, the oldest firm export sulfur nationwide. In Paliorema Brimestone mines, you can combine your bathing with one of the geological sites of the mining history of the island. You can sit on the beach with colorful pebbles and sandy beach, while you enjoy your swim overlooking the old quarries that used to export sulfur and brimestone and the ruins of the factory premises. Carriages on the rails, rusty tools, ruins offices, parts and personal effects of the quarry workers, creating a charming landscape. Historically, between 1890-1905 operated by the Society for Public and Municipal Works. In 1905 the operation ceased the production of cheap uncle in America, 1910-1918 worked sporadically, and the early 30 ‘was fully operational and established plants that survive today. The Sulfur mines functioned until 1960, and the company finally closed in 1978. Sarakiniko: On the north-east side of the island, you will find the most photographed scenery of the Aegean: Sarakiniko. The lunar landscape that is unique. The eroded volcanic rocks penetrate the emerald sea creating large and small caves, and the lack of green space, combined with the white rocks and the intense glare of light, creating a landscape resembling the moon and an unforgettable experience for you to visit . Sarakiniko, which took its name from the Saracen pirates, overlooking Sifnos and Kimolos, and we recommend that you visit when you do not blow on the island north winds. Finally, note that it worthwhile to see not only the day but at night with full moon, because the white cliffs of soft materials strongly reflect the light, even the moon, and create a landscape that is unforgettable. Kleftiko: The complex of these volcanic rocks prototype is an enchanting landscape worthy of admiration, but also a place to enjoy the feeling of transparent blue-green water and sun. Kleftiko was old pirate base, where they passed the pirate ships and moored to protect the small coves and the majestic cliffs. Today, this unique geological formations, creatures of air and sea, ideal for swimming and exploring. Access is only by sea and for this we suggest a marine excursion to this beautiful landscape. The prehistorical city of Phikakopis: On the way to Pollonia will find on your left the discoveries of ancient Phylakopi, which is the most important settlements of the Cycladic culture and the important city of the prehistoric Aegean. In this preserved relics 2 millennia. There are traces of habitation from the beginning of the Early Bronze Age (ca. 3000 BC) until the end of the Late period (1100 BC). Situated in the north of the island, to give potential surveillance in much of the sea, Phylakopi became a great commercial and cultural center. Thanks to the marketing of the precious stone of obsidian, developed rapidly gained strength, erection of cyclopean walls and destroyed the invaders and resurrected three times. The settlement was inhabited as early as 3000 BC and abandoned in 1100. having gone through three historical periods. In pre-settlement era (3200 BC.- 2300 BC.) Began building houses. In the first historical period (2300-2000 BC) the settlement is approximately 200 meters (large by that time in the Aegean), has organized town planning layout, but has a relatively organized cemetery. Moreover, at that time revealed the use of stone and obsidian multiply exports, leading to full commercial boom of the Melians. In the second period (2000-1600 BC) built walls to protect against any attacks, the graves are now outside the walls, while the houses are staggered arrangement on the hill. In this period became especially clear with ceramics now Minoan influences and further developed the commercial relations of apple trees with different regions of Greece and especially in Crete. This period ends with the destruction of Phylakopi, probably invaders from fire, while building the third village, begins third historical period of the city (1600p.Ch.-1110p.Ch). The ancient town of Klima: In the village of Klima will find the ruins of Old Klima , the first port of the island. After the decline and destruction of Phylakopi, the Dorians built from the southern part of Tripiti up the site of present-Klima, the second major city of the island (1100p.ch.-800p.ch.). Today you can visit the two citadels of the settlement, the hill of Prophet Elias and Pyrgaki-to see pieces of the wall of the market segments of the temple of the Hellenistic and Roman periods, divisions of the ancient theater and the spot where the Venus de Milo. Katiforiste the end of the road Tripiti to the Catacombs, leave your car and walk the path. Initially you will see the walls of the ancient city and a few steps away, in an area that was suppose the high school, you will see the place where the local farmer found in 1820 the famous statue of the goddess Venus (120 BCE). Continue walking on the dirt road will take you to the ancient Roman theater. The ancient Roman theatre: The ancient Roman Theatre was originally built by the inhabitants of the ancient city of Klima, probably during the Hellenistic period (3rd century BC). But after the destruction of the city by the Athenians during the Roman times, over the surviving foundations of the classic built with a larger white Parian marble and wonderful reliefs, estimated that seated about 7,000 spectators. This is the type of theater you see today. From the theater survived seven marble stands, six rows of seats, the auditorium, the orchestra, the floor of the stage, and many architecturally elaborate parties. The excavations began in 1989, while the command for the first clean up by Louis II, father of Otto, prompted by the L. Ross, who along with Otto was the first who visited the theater in recent years. Situated in a prominent position on the hillside has breathtaking views of the harbor and excellent acoustics. Thus, there is little time available for theatrical performances and musical events, since in its current state can accommodate up to 700 people. 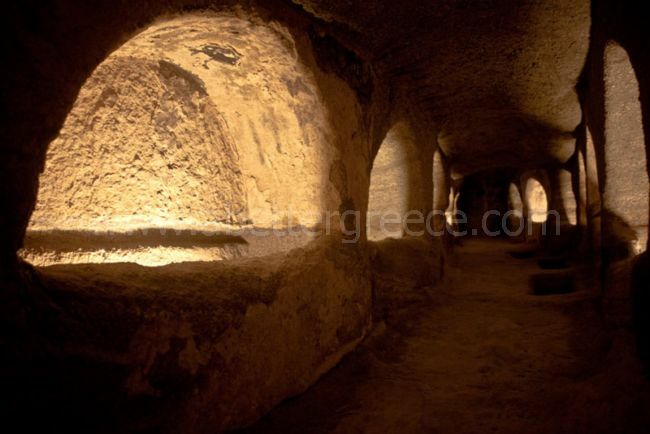 The Catacombs: The catacombs are located near the village of Tripiti in caves 150 meters above sea level. In 2009 the Holy Synod proclaimed Apple as a sacred island, since the Catacombs is the oldest monument of Christianity. He was the first venue of the first Christians and the first community cemetery in the late 2nd AD century. The Catacombs of Milos is unique in size to the entire country and the most famous and remarkable Christian monuments in the world, alongside the catacombs of Rome and the Holy Land. The labyrinthine complex that consists of three major first-independent-underground (A, B, C) cut into the porous volcanic rock, five aisles and a rectangular burial chamber in the form of cubicula the Catacombs of Rome. Each catacomb has a different width (1-5 m) and different heights (1.60 to 2.50 meters). The total length is 185 meters and now preserved in the walls of galleries 126 “arcosolia” (apsidal carved tombs.) Arcosolia The color was decorated (red stripe on the rim and deep blue surface of the drum), but still remain traces of the color of decoration. The current version of the catacombs reflects some interventions of the 20th century, as the entrance to the burial chamber B and the passages that connect the three originally independent catacombs. 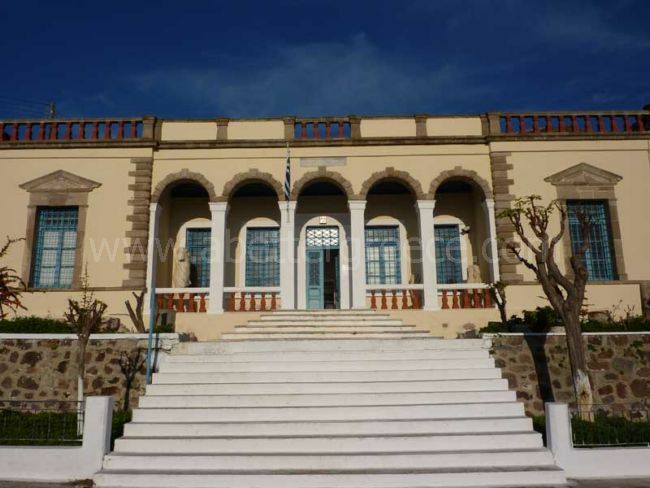 The Ecclesiastical museum on Milos: Located very close to the port of Adamas, the church of Agia Triada, which hosts the Ecclesiastical Museum. The church, which counts one thousand years of life, characterized as “cross-shaped basilica after troullokamaras” a consists of three aisles over which the dome rises vertically in the same shape as the church. This kind of church is found very rarely (only one other church in the Peloponnese, in Levidi Arcadia) and is a very interesting architectural monument. Originally created to serve as a monastery by the name of Our Lady of Theophanes, but in 1839 bought the Cretan refugees and made the church of their village. Edges and arcs of the belfry is influenced by the Gothic, while the lintels and doorposts are decorated with sculptures of traditional and religious motifs. In the entrance, the courtyard, you will see two mosaic creations of local artist John Kavroudaki. These two colorful mosaics dating back to 1937 and depicts a dragon in a figure of Milo and the other the battle of good and evil. Since 2000 the Trinity and housed the Ecclesiastical Museum of Milos, where you have to admire much of maleate artistic tradition and heritage and maleate hagiographic tradition. More specifically, you can see pictures from the 14th century (as a rare pieta), works of the Cretan School, works of Emmanuel and Anthony Skordili and Cretan painters, wooden desks and epitaphs, iconostasis of the 17th century, the episcopal throne, temples , silver chalices, censers, votive gold, rings, necklaces, earrings and other exhibits of high artistic value. 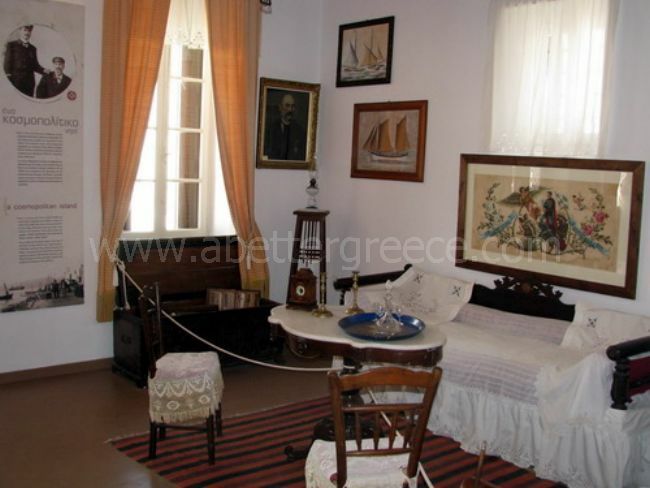 Folklore museum of Milos: Behind the church of Panagia Korfiatissa in Plaka, you will find the Museum of History & Folklore of Milos. The museum was founded in 1967 by the “Union of Athenian Milion” and this is your chance to learn about the life of the Melians after the 17th century (mostly from 1850 until 1930, was a period of prosperity for the Melian society) . Your visit to this museum will travel to a different era, one will see how it was an urban household Milies 19th century. The museum is not an accurate representation of a type Milies household, but starting with often disparate objects, illuminated aspects of life for residents of that era: the chores inside and outside the home, the influences from other places, food and clothing preferences The fun way, the organization of space and time and the use of local resources. The mining museum on Milos: The Mining Museum of Milos, non-profit corporation, created by S & B Industrial Minerals SA in 1998 to honor and promote the mining history and the geological and natural heritage of the island. In the room on the ground floor presents the social, economic and technological dimensions of the mining history and tradition of the island. The report of the first floor is dedicated to the natural and geological wealth of the island, showing the minerals mined in the island from the Neolithic period to the present industrial minerals, with particular emphasis on their uses in everyday life. Additionally, Films for the exploration and production of the minerals, while the projection room, visitors ‘travel’ in earlier times through the narratives of former miners. The Museum carries out geological walks organized and hosted in the premises of educational programs and organized educational and recreational activities in cooperation with specialized educational institutions and museum educators. During the 12 years of operation the Museum has received over 135,000 visitors from Greece and abroad and has become a popular educational tourism destination. The nava museum of Milos: The museum opened in September 2008 and is housed above the port of Adamas, the building of the old communities of the island. Created by the efforts of the physician Peter Armenian gather many exhibits relating to maritime activity in Milos. The exhibits range from prehistoric times, with tools from obsidian, go to the battle of Salamis and end up in later years. 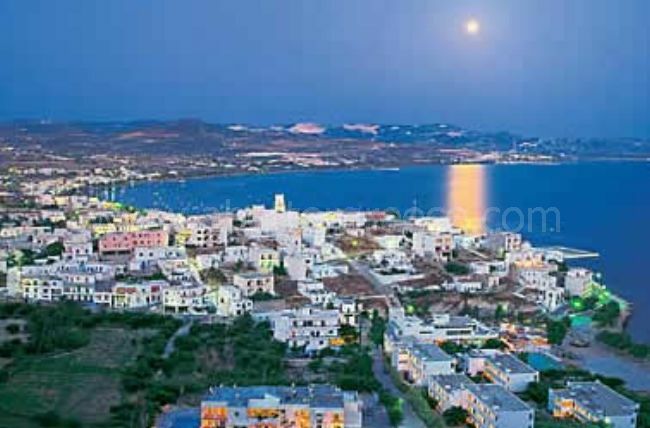 Adamas village on Milos: This modern seaside village located in the bay of the island, one of the largest and safest natural bays of the Mediterranean, and is the biggest tourist center of the island. The Diamond is the main port and the first picture you will see as you approach by boat. Built in the north of the bay, the Diamond or “Alamanto” as it was before, inhabited by 1824. It was built by Cretans persecuted refugees from Sfakia, who came to Apple after a failed and bloody revolution against the Turks, and now has about 1100 inhabitants. The coastal island city is composed of whitewashed houses with flower gardens and small narrow quiet streets, which together form a picture of exquisite Cycladic beauty. The Diamond in the summer months is full of life. In this village you can combine relaxation and tranquility with its nightlife and entertainment, while you and provide everything needed for comfortable and enjoyable holiday: cafes, restaurants, ouzo, pizza, barbecues, grills, bar, club, shops, supermarkets, banks, port authorities, customs, clinic, pharmacy, dental, agency Greek and international press, etc. Here are current and nightlife, with bars that raise diverse musical rhythms and tempo of fun until the early hours. If you want to swim, the Diamond you offer it. Within walking distance and accessible without transport, you can find the beaches of Lagada (500 meters from the center of Adamas) and Papikinou (1 km from Adamas). Plaka village on Milos: The Plaka is the present capital of the island and one of the most intact capitals of Cyclades. The name comes from the level ground on which the houses were built of the first inhabitants, where now the Castle could not accommodate the entire population. At the top of the hill of Plaka is the imposing Venetian “Castro” of the 13th century where you can enjoy picturesque sunsets with wonderful colors and panoramic views over the bay of the island and in nearby Cycladic islands. H Assumption of the Virgin and Virgin Media is the church that will meet the top of the castle, while ascending and descending to and from the castle you will see another beautiful church, built in black rock, the Ypapanti of Christ or Mary Thalassitra. Still, do not forget to visit the metropolis of the island, the Virgin Korfiatissa, which offers a dreamy sunset from the marble yard. Finally, the traditional village of Plaka you will find also more public services, and two museums that keep the cultural heritage of the island, the archeological and folklore. Triovasali & Plakes villages on Milos: Starting from the port before reaching the plate, the first village is Triovasalos and Beyond Triovasalos. These two almost contiguous villages were established on two adjacent hills, are densely populated and built an amphitheater, but a significant commercial traffic. The “cart road” in Triovasalo a central point of the island, since there are several banks, public offices, cafes and shops. Finally, in Triovasalo and Beyond Triovasalos you can visit the two churches of those villages, St. Spyridon and St. George respectively. Plates: The plates, a small village with white houses and narrow streets, located between the plate and Triovasalo. Built at the foot of the castle and took their name (i.e. straightening) from the area was flat. If you are the plates, you can visit the village church of Saint Charalambos, where you will find one of the oldest images of the island, the Virgin Akradiotissa. Finally, the plates you can easily and quickly to stunning beach Plathiena. Pollonia or Appollonia village on Milos: Pollonia or Apollonia is a picturesque fishing village of 300 inhabitants, built around a beautiful bay on the northeastern tip of the island. Pollonia is the second port of Milos at Adamas, and named probably from the temple of Apollo was the Lighthouse of Pelekoudas (to the left of the settlement). Refrain almost 10 km from Adamas and 14 from the plate, and from there takes place the communication with Psathi, the neighboring port of Kimolos. Small boats, water taxis and Ferry-Boat will take you no more than 30 minutes from Pollonia Kimolos. This settlement has a rich beach sands, many inns and hotels and taverns, restaurants and cafes islands that lie to the right edge of the village, the church of Ag. Friday. The pier in front of the church you can find fishing boats of the locals who come every morning loaded with fish, octopuses and lobsters, and from there start and excursion boats to the Cave of Papafranga and Glaronissia. On the left side of Pollonia the chapel of St. Nicholas and the shavings, a scenic peninsula that is worth visiting, because according to tradition, the couple sits on a small rock shaped chair that is there, stays together forever. Finally, the road to Pollonia will find the ruins of the ancient city of Phylakopi and beaches Mytaka, St. Constantine and Papafranga Boar, while leaving the village towards the south, you will be directed to the Sulphur mines. Tripiti village on Milos: Tripiti is a traditional preserved settlement, almost joined to the plate hotel is built over the ruins of the classical city of Klima. The name comes from the soft volcanic rocks, which seemed bored, as well as the many holes carved into the rock on which it is built. The village square stands the church of St. Nicholas, and in this village are unique, picturesque old windmills used for grinding grain and today most have been converted into apartments. In Trypiti you can enjoy panoramic views over the bay of Adamas and gourmet delicacies in taverns and restaurants of the village. Nearby you can visit even walk the catacombs and the ancient theater. 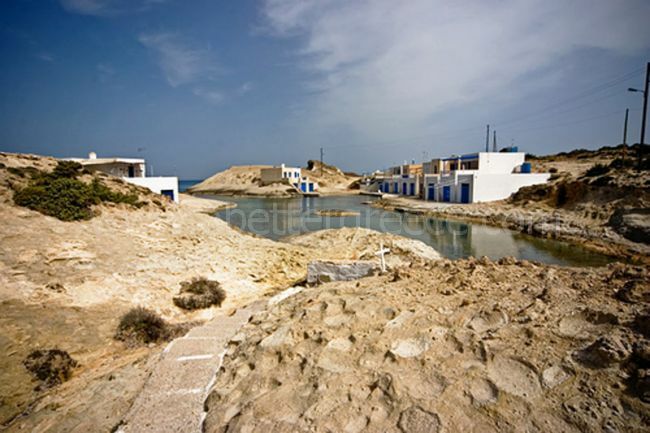 Zefiria village on Milos: The village of Zefiria is located in the center of Eastern Milos to a distance 5.5 km from Adamas and 9 from the plate. Created by the Venetians in the 13th century, flourished and became the capital of the island thanks to the existence of pirates and abandoned in 1767 due to damage from earthquakes and because of epidemics caused by the gases of the faults and forced the inhabitants to permissible to bring. Today Zefyria is a vibrant rural village with about 150 residents and passing from there leads to the beaches of Agia Kyriaki and Palaiochorio. 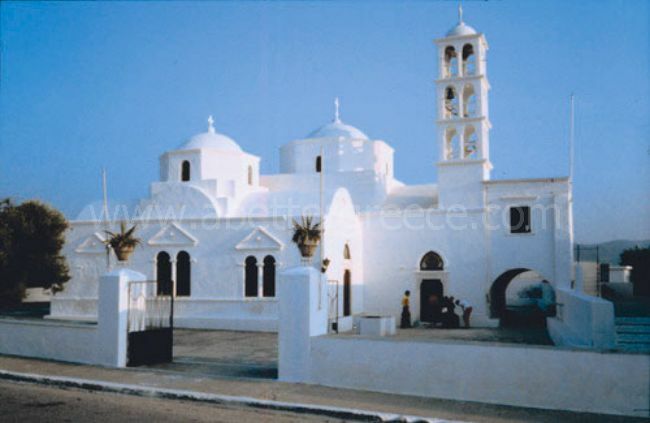 Finally, in this village stands the old Cathedral of Milos, Lady Portiani, along with omotoichi church of St. Nicholas, while each dekapentafgousto honoring the memory of the Virgin Mary organized one of the most important festivals of the island. Klima village on Milos: Traditional fishing village with few inhabitants and colorful two-storey houses in natural cavities of rocks. Downstairs, the so-called “wires” were kept the boats of fishermen, while in the loft living families. Today most of these wires are rented and waiting to be photographed surrounded by playful colors of doors and windows and their cat lying lazily in the sun. Besides this, the area of Klima will see the ruins of the old town and the first port of the island. After the decline and destruction of Phylakopi, the Dorians built from the southern part of Tripiti up the site of present-Klima, the second major city of the island (1100p.ch.-800p.ch.). 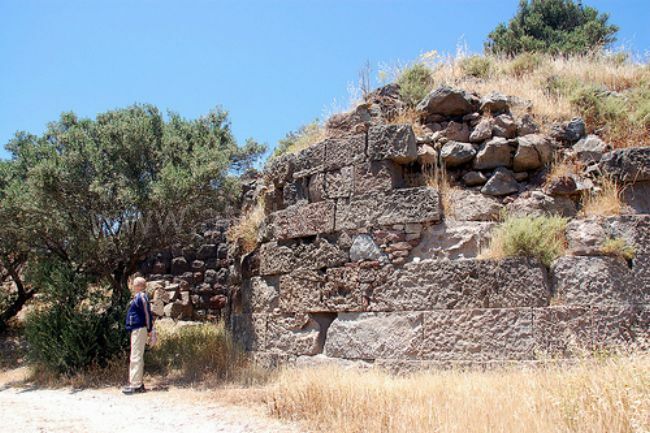 Today you can visit the two citadels of the settlement, the hill of Prophet Elias and Pyrgaki-to see pieces of the wall of the market segments of the temple of the Hellenistic and Roman periods, divisions of the ancient theater and the spot where the Venus de Milo. Katiforiste the end of the road Tripiti to the Catacombs, leave your car and walk the path. Initially you will see the walls of the ancient city and a few steps away, in an area that was suppose the high school, you will see the place where the local farmer found in 1820 the famous statue of the goddess Venus (120 BCE). Continue walking on the dirt road will take you to the ancient Roman theater, where there is a path to go down to the bold village of Klima. 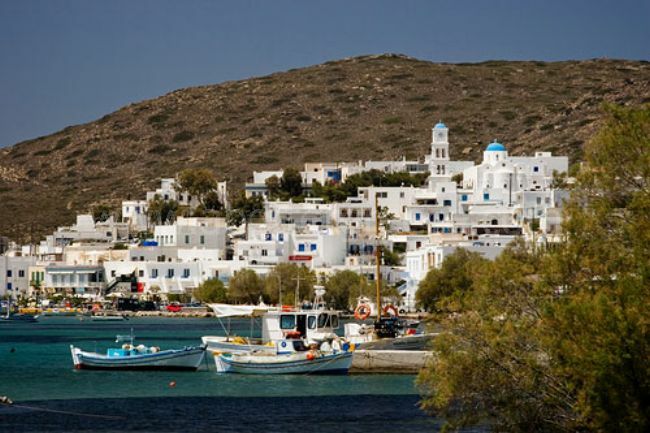 Firopotamos village on Milos: A seaside village with a small, but organized beach suitable for swimming and fishing. It has many trees and creek surrounded by “wires”. In the end, after the fishermen’s houses, you will see the derelict stairs loading and the church of St. Nicholas. Mantrakia settlement on Milos: Located just 5 kilometers to the west side of Plaka you will find another fishing village with “wires” and holiday homes, Mandrakia. The resort has rooms and restaurant, while a short distance you will find the beach of Fig Tree, a small beach about 150 meters in dark gray pebbles and crystal clear waters. Ayios Konstantinos: On the way Pollonia will see to your left a short detour leads to small, quiet seaside resort of St. Constantine. The beach town is fairly quiet and beautiful, while the right hand side among the rocks formed two small caves where the waters come and go and are ideal for exploring. Empourio settlement on Milos: A small and quiet village on the northwest side of the island (17km from the plate), once an important commercial center. Today it is almost deserted, has a small port, a picturesque tavern by the sea and beach to swim. As is appropriate for nature lovers and people who hate the crowds, while nearby the beach is also quiet Fatourenas. Obsidian from Milos was a commodity as early as 13,000 years ago. Milos natural glass used for razor sharp “stone tools” was transported well before farming began and later: “There is no early farming village in the Near East that doesn’t get obsidian”. The material was transported for thousands of miles. The position of Milos, between Greece and Crete, and its possession of obsidian, made it an important centre of early Aegean civilization. Milos lost its arms-making importance when bronze became the preferred material for the manufacture of weapons. At the Bronze Age site of Phylakopi (Greek Φυλακωπή), the chief settlement, on the north-east coast, excavations by the British School of Archeology revealed a town wall and a Minoan palace with some important and very interesting wall paintings. “The famous fresco of the flying fish found in the ruins of the principal house or palace at Phylakopi, with its delicate coloring and graphic observation of nature in the graceful movement of the fish, seems to be the work of a Cretan artist, who probably was summoned to Milos for the purpose.” Part of the site has been washed away by the sea. The antiquities found were of three main periods, all proceeding the Mycenaean age of Greece. Much pottery was found, including examples of a peculiar style, with decorative designs, mostly floral, and also considerable deposits of obsidian. There are some traditions of a Phoenician occupation of Milos. 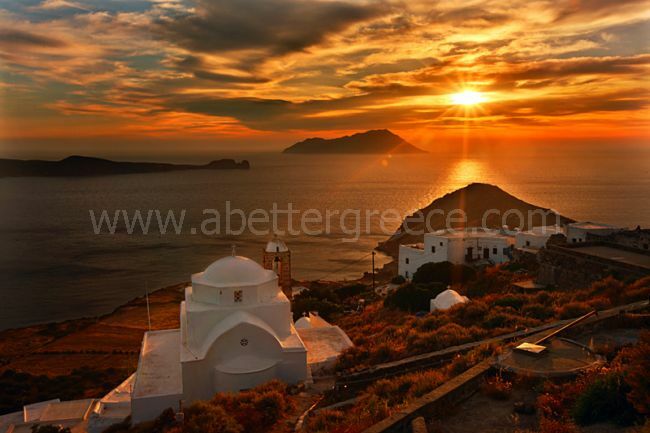 There are some rentals agencies on Milos Island, here are some of the recommended agencies! Milos is an undiscovered Cycladic island, with maybe the most interesting coast of any other island this size in the whole world. A volcanic island, Milos is known as the island of many colors, mainly because of its beautiful, colorful rock formations. Milos is the most south west island and 5th largest island of the Cyclades archipelago, only 3-5 hours from Athens by ferry, or 30 minutes by aircraft. It is located west of Santorini, right between Heraklio, in Crete and the mainland of Greece. It has 5,000 inhabitants that earn their living primarily through tourism and mining, and some through fishing, farming and agriculture. There are alot of beautiful beaches on Milos, archeological sites and interesting things that you should not miss while on holidays on Milos. 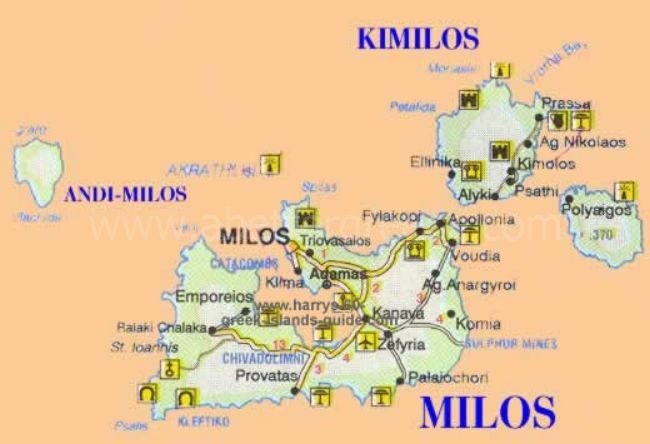 Information that might be necessary for you to discover Milos is right here!